People coming out of prison are often open to fraud of all kinds. (c) Kirill Kalinnikov / RIA Novosti. All rights reserved.Russia has one of the highest recidivism rates in the world. 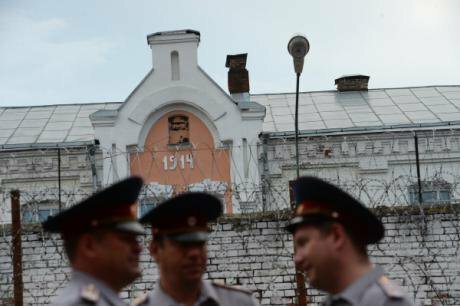 According to the Federal Penitential Service, more than half of Russia’s prison population at any moment consists of people who have done time before. Committing a second offence and going back inside can be the result of a number of factors. Among them are the nature of the prison system itself, the lack of any effective rehabilitation programmes, financial difficulties after release and the stigmatisation of ex-offenders. People who have served a prison sentence have problems finding work, often can’t return to their families and often have no permanent home or steady income. They may have learned a skill or trade in prison, but find it useless in the job market outside. They have also lost their social connections. Women coming out of prison have even more problems: they have often lost custody of their child or children, who have been taken into care, and it’s not easy to get them back if you have no home or income. Left without adequate support, not to mention cash, someone might well commit another crime and end up with a stiffer sentence as a repeat offender. But the government does little to address the problem of rehabilitation. oDR asked Polina Mazunina, a psychologist working at Perm’s State Social Adaptation Centre, to explain how the support system for ex-offenders works and why in its present form it can do very little to solve their problems. What does the Social Adaptation Centre do? We have several sections, and in one of them we offer help to able bodied homeless people. Most of our clients are people who, for whatever reason, can’t live in their own home, or don’t have a home, and about 90% of them are ex-prisoners. Some come to us by themselves some time after their release, but many are referred to us immediately on leaving prison. Some people have no home of their own — before they went to prison they worked and rented a flat. Others have somewhere to live, but it’s unfit for habitation. One man had a house on the outskirts of Perm, but while he was inside it was burgled and had all its windows smashed, so it was uninhabitable. What other difficulties do offenders face then they leave prison? Many of our clients have no ID papers. They often leave prison without them: theoretically this is legally impossible, but it happens all the time. Sometimes they have their ID papers, but not the other documents they need to get a proper job. Many arrive in prison with a full set of documents, but leave with just their basic ID. The prison administration people don’t even try to explain this: they’ll tell you that they haven’t been able to find them — the prisoner was moved between camps and probably lost them in transit. Our main aim is to find people temporary accommodation, sort out their papers and help them into work if they are having difficulties with that. Most of them are not officially registered at any address, so we give them temporary registration somewhere so that they can at least sign on at a jobcentre. Without a registered address, it’s pretty much impossible to find any official employment. Another group at risk are disabled people of working age. They’re usually placed in the lowest disability category, even if they can’t really work. Russia has very stringent requirements for disability benefits, but it’s difficult to rent accommodation on these benefits. Sometimes we find placements for people in private shelters, because the bureaucracy will only provide funds for state shelters for those of pensionable age. Accommodation in these shelters is funded out of residents’ pensions — by law, they can take up to 75% of their benefits, depending on the services they offer. But often private homes take the entire amount. Officers at Vladimir Central prison. (c) Alexey Kudenko / RIA Novosti. All rights reserved.We had a case where a shelter in the Perm region burned down. A number of residents died in the blaze; others were badly burnt. The rest were referred to us, and talking to them, we realised that all their benefits were taken from them to fund their accommodation. But they weren’t particularly complaining. Some had mental health problems and weren’t bothered about benefits; others were happy with their lives — they lived in a barracks in the countryside, surrounded by nature; they were more or left to their own devices, with no strict rules to follow. After a couple of days the reason for the fire became clear: the inmates had started smoking en masse in their rooms. How quickly do ex-offenders find work through your centre? If there are no admin problems (they have all the papers they need) it depends on how much their skills (if they have any) are in demand. Women usually have fewer problems finding work because they’re less fussy. They can get jobs washing, cleaning or working in restaurants. Their time behind bars matters a lot less in jobs like this, even if they were convicted for theft. "The problem is that most of our clients are afraid of leaving the centre and encountering the unfriendly world beyond"
We had one young woman who had been in prison for theft and had difficulty finding work because her skills were very specific — she was a sewing machine technician. She’s good at her job, but it’s difficult to find a vacancy in that particular area. She has started to work at the centre, in an admin role, but I think she has a lot more potential and could in principle find work outside and move on. But the problem is that most of our clients are afraid of leaving the centre and encountering the unfriendly world beyond. And what about male ex-offenders? I think they have more difficulty finding work. If they are skilled workers (welders or frame-saw operators, for example) they have a good chance. But if they don’t have a specialist skill, it’s down to handling freight or working as a security guard, and not every employer wants to hire an ex-con for that. The security service checks them out, and if they were convicted of theft, they’re less likely to get a job. Which just leaves construction work: off-the-books, cash in hand and no guarantees. That doesn’t solve their problem. 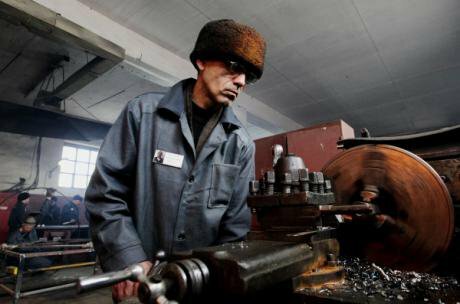 A Russian-language broadcast on the problems of "adaptation" for former prisoners. Source: SGU TV. Security guard work isn’t ideal either: people can go months without being paid, or get an advance of 200 roubles [£2.56] a day, to cover getting to work and having something to eat. They’re never given a contract: there’s always an excuse — the printer’s on the blink, the bookkeeper’s not around, people are on holiday and so on. Naturally, they’re not going to stop working: they hope they will get paid and have some stability. They’re just thankful for any job: after being turned down dozens of times they now have some hope again, even though they wouldn’t have chosen this one. People who have been in prison are always open to fraud of all kinds. Just about every man who has tried to find a security job through our centre has been “ripped off” in some way at least five times. How are these situations resolved? They leave, in a variety of circumstances. Some try to get the money they’re owed, and some of these are even successful. Some appeal to the courts, but that doesn’t always help. Even if a client wins his case, it doesn’t mean he’ll get his money. The people that go through the courts are those with “justice-seeker” personalities, who will fight to the end, whatever the odds. But most people just give up in the end and go off to look for happiness elsewhere. What happens when a client finds work? Our clients can stay at the centre for a while after they have found work. We sign an agreement with them for two-three months with a possibility of extension. If someone finds a job as a watchman, or where there is accommodation, he disappears pretty fast. Unfortunately we have no way of finding out where he’s gone and what happens to him afterwards. Many people who go elsewhere disappear after a short time – either they’ve found work somewhere else, or something has happened to them, or they’re back behind bars. Anything could have happened. A prisoner at work in Primorsky krai. (c) Kirill Kalinnikov / RIA Novosti. All rights reserved.We have many returning clients, including some that have come back to us after completing another stretch in jail. Some haven’t got on with employers; others have been cheated by estate agents – that can happen too. If someone applies for a place at the centre but we are full up, we ask them to phone regularly and check if a place is free. Some just need a temporary registration address, rather than actual accommodation, so they too are hard to keep tracks on. There are also people who are officially registered with us but never appear. If a person disappears for three days without giving a reason, we can cancel the agreement, so we have a high turnover. What relations do you have with clients’ families? Do they try to reconnect with them? Usually they have lost all contact: most of our clients feel very bitter and hurt, but they have a certain pride at the same time – people aren’t ready for any contact; they think their relative might be trying to cadge something. If family members have illegally de-registered or sold a flat in which the client had a share (but didn’t sign any papers) — not many clients will take it to court. It’s an attitude: I don’t need anything from you, I’m nothing to you and you’re nothing to me. With serial offenders it’s more complicated. If there’s a second offence and it’s connected with drugs or theft, relatives are rarely keen to reconnect – they might be ashamed of the person or distrust them. Also, a man with a record in a family is often taken for a scrounger: he drinks; he’s unemployed; you can’t ask anything of him, he won’t help with the housework. What’s he good for? "At counselling sessions we put aside some time for this particular aspect of their experience. But the law and nationwide standards make no distinction between cases"
A woman might re-integrate with her family quite quickly. Problems mainly arise with people who are heavily dependent on narcotics or alcohol. But at the same time, older women without any criminal record, who have just been thrown out by their families, often turn up at the centre. Women ex-offenders can also be in trouble: almost all of them have health issues and they are often HIV positive and have lost custody of their children. They try to get the children back, but it’s not easy: they have to register with a narcotics specialist and they are often homeless. If the children are not in care, they are being looked after by aunts and grannies, who often keep them away from their delinquent parent. But once they are grown up, children sometimes try to find out about their parents and get into contact with them again. One person who stayed with us here after leaving prison was a woman of around 50 who wanted to find her daughter, who would have been 16 or 17 at the time. We found her VKontakte [social media] account, and they had a pretty dramatic online chat. The daughter reminisced about how her mum used to treat her: she would beat her and then she abandoned her, and the girl felt a lot of hurt and hatred, but love and attachment at the same time. In the end, the daughter left her phone number. The woman was an alcoholic and herself a victim of domestic abuse who was often severely beaten by her partner. In the end, she killed him, hence the prison sentence. The daughter had her own child at the age of 17, remained a single mother and her life was more or less a repetition of her mother’s. Have many of the women who come to you experienced violence? Many of the women have experienced violence, both at home and outside it. We recently had a client who had left her husband after he had beaten her badly and broken her arm. We talked about various options, about her getting a job, but she’s now in depression and totally apathetic. There are many women like this, who literally run away from home because of violence. Many of the female ex prisoners who come to us have also killed their partners after being violently treated by them. We have had a lot of stories like this over the last two years. We also have a section for women and children who have been in an abusive situation. Is the social rehabilitation of women ex-offenders different from that of others who have just been through difficult times? Yes, of course. Their prison experience definitely leaves its mark, especially if they had a long sentence. At counselling sessions we put aside some time for this particular aspect of their experience. But the law and nationwide standards make no distinction between cases. Every client has the right to one or two counselling sessions a year, regardless of their circumstances, because our section allows an overnight stay. You arrive, you stay the night and you get your records updated, but for the rest — be good at your own expense. In the end we decide for ourselves how to work with each client and we give them a psychological check up, although we’re not supposed to. We also have no leisure or cultural programmes for clients. The goal is to get the person into work. There are books and a TV in the centre, that’s your leisure time taken care of. "Formal procedures are particularly stressful for ex-convicts, and sometimes job hunting can turn into a disaster area. Filling in forms becomes an unbearable ordeal"
I believe that it should all be different. I would put more emphasis on counselling, especially if the client has been in prison for 20, if not 30 or 40 years. These people are completely unsocialised, in every way. Have you any idea how they talk to potential employers? A man who has spent a cumulative 40 years in prison rings an employer, doesn’t even say hello or introduce himself, but gets straight to the point: “I want work”. That’s no way of making contact with an employer. There’s no question of him being given a job after that. How are situations like this resolved and do the staff at the centre help clients talk to potential employers? Formal procedures are particularly stressful for ex-convicts, and sometimes job hunting can turn into a disaster area. Filling in forms becomes an unbearable ordeal, and they complain to me whenever they are asked to fill in anything. If they are told to expect a call in a few days, they assume they have been turned down: they don’t understand that employers need time to think and select. We support them, of course, which includes explaining that although they might be turned down for something because of their criminal record, they shouldn’t give up hunting for a job. Is there contact between the people staying at the centre? Yes, it’s a friendly place; everybody gets chatting in the kitchen and smoking room. You also have a lot of people pairing off. A couple, married with two children, recently asked us for help — they lived on the outskirts of Perm but some road works started nearby and it was difficult for them to get into the city. They had to move house, and meanwhile the children were put into care and the parents came to stay here. And it turned out that they had actually met at the centre 10 years ago, and been together ever since. And that isn’t an isolated case. A lot of people meet here and go off to live together or find someone to share a flat with. It’s mostly heterosexual relationships, though. There’s generally a lot of mutual support among our clients, although there are always some who try to sponge off everyone else or introduce some kind of prison set up in the room. People can be permanently traumatised by their prison experience, especially if they have had a long sentence, and this defines their entire life and behaviour. If they have acquired some kind of authority in the prisoners’ hierarchy and occupied a certain social status in their barrack room, they’re very hard to work with. They drink and take drugs here in the centre, tear the place apart and make life difficult for everyone else. This kind of behaviour is of course clamped down on. But we don’t throw them out – that’s not what we’re here for. In the worst cases we might try to revoke their agreements, but we start by talking to them and moving them to other rooms. These are also the people who are forever complaining to the ombudsperson or the public prosecutor’s office, where nobody has a clue – they just phone us and tell us to extend their agreements. There’s a certain peer pressure involved: the guy feels uncomfortable, it’s an unpleasant situation, and he tries to deal with it by adding whatever aggression he can to the mix. But sooner or later everything comes to a head and he just leaves the centre. Are there other centres working with people in difficult circumstances in Perm or its surrounding area? There are similar centres in Berezniki [the second largest city in the Perm region] and another town, Tchaikovsky. 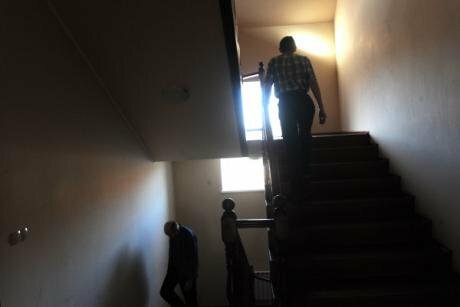 There are also private homes and rehabilitation centres that work with homeless people and those who are alcohol and drug dependent. But they are generally aimed at people of working age, whom they often use as cheap labour. These centres have contracts with various organisations and fix their clients up with jobs in construction, where they work without pay, just for food and lodging. If they are lucky, they might also get help with their ID papers. The people who agree to these conditions are in desperate situations — they have no alternative and they at least get a roof over their heads to see them through the winter. The only people they won’t take are those who can’t work: the sick and the elderly. I have a lot of doubts about these so-called rehabilitation centres, do they even deserve the name? We recently had a man of 50 come to us: after he got out of jail he lived in various rehabilitation centres. He couldn’t work and just helped out around the building, but eventually they threw him out and he ended up on the street. He has quite severe mental health issues, is now in hospital for tests and the most he can hope for is registration as disabled, which will give him some benefits but won’t solve his homelessness problem. "Most so-called rehabilitation centres are basically workhouses, and part of some large private network. They almost always have some religious connection, but communing with god doesn’t suit everyone"
Effective rehabilitation centres do, however, exist. They have detoxification and other therapeutic programmes, give people guidance after their initial treatment and look after their welfare for a long time. Their families also get involved and provide what financial support they can. I have seen this system working in St Petersburg but I’ve never found anywhere working along these lines in Perm. Most so-called rehabilitation centres are basically workhouses, and part of some large private network. They almost always have some religious connection, but communing with god doesn’t suit everyone: there is a need for normal psychotherapy as well. People also come to us after detox treatment in state run clinics. Again, I haven’t seen this approach working, any record of sustainable remission from dependency. People come straight to us out of the detox clinics and start celebrating their liberation — they see the clinics as a temporary stopover where they can eat and sleep. Why are you unable to follow your clients up after they have left your centre? We have such a turnover of clients that all we can do is document it. We don’t have a specialist who could follow people up after they’ve left the centre. We can take someone’s phone number, but they might change it. I don’t even really know how we could keep tabs on former clients. In the first place, it’s not something the government takes any interest in. We work to certain standards and regulations, but there’s nothing in them about follow-up.